NuvoDesk is Arlington’s premier coworking space, and we’ve become well-known for our versatility and ability to offer something for everyone. Among our many offerings – space for your private event. We know that entrepreneurs, freelancers, and professionals have unique and specific needs, and with our private event space, you get the area you need, as well as a number of amenities designed to cater to you, your team, and/or your audience. WHAT CAN YOU DO WITH NUVODESK PRIVATE EVENT SPACE? There are no one-size-fits-all options at NuvoDesk. We aim to offer the best solution for your private event space needs. Not only is NuvoDesk known for its versatility, but our facility is also a fan-favorite for its amenities. NuvoDesk boasts a desirable location with easy access to AT&T Stadium, Globe Life Park, Texas Live, Six Flags, River Legacy Park, and all the restaurants and shopping you could want. If you want to grab a bite to eat or a beer, you can get everything from craft beer to gluten-free foods at our on-site BFF Cafe. 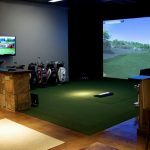 When you’re ready to take a break, we offer the most leading-edge golf simulator to help you relax and have fun. When you’re hosting a private event, you want to offer your team, clients, and audience the best experience possible, right? We understand, and that’s why NuvoDesk offers a sleek and contemporary design with beautiful decorations and comfortable furniture. We keep ergonomics in mind, and you can expect a world-class experience for both yourself and your guests. NuvoDesk is Arlington’s premier destination for your private event needs, and we offer the ideal space for your professional event, workshop, fundraiser, product demo, and everything in between. Contact our team today to reserve your Arlington private event space now! Are You a Working Mom? If Yes – NuvoDesk Introduces a “Mom’s Room” Just for You!